First off, we’re going to have a quick fly through what sugar is, so that we’re all on the same page. Sugar is found in many more forms than the white granules you might put in your tea or coffee. In fact, sugar is almost unavoidable. Because it exists in a wide array of foods we all eat on a daily basis. You’ll find it in fruit, honey, fizzy drinks, sweets, donuts, cereal, yoghurt, and countless other foods. These sources of sugar are generally split into two categories, ‘natural’ and ‘processed’. Natural being those found in fruits and things of that nature. So think bananas, berries, honey, and foods like that. Processed sugars are demonised as the baddie in this relationship. So think of table sugar and high fructose corn syrup (the stuff they put in fizzy drinks) here. But all may not be as simple as it appears on face value. Are processed sugars really the Mumra (80’s cartoon reference) of the sugar world? Or does it not really matter what type of sugar you eat? Well, to answer that question, we need to get granular (pun intended) and be clear on what sugar is and what it’s doing in the body. First off, sugar is nothing new. In fact, it’s something that’s been in our diets for thousands of years. A quick flick through the history books shows that sugar was used for medicinal purposes as early as the 1st Century CE. And then in the 5th Century CE, crystalised sugar was discovered in India and given the name Khanda. Interestingly, this is where the name ‘candy’ is derived. But what does sugar actually do? The main purpose of sugar is to act as the main energy source for the body. It provides your cells with that all important fuel. So whether it’s to fuel those bench press PBs or to simply keep your brain ticking over, sugar is important. Now, we don’t need to go into a full-on science lesson here, because I’m sure you just want the facts. So, in that case, I’ll keep this section brief. Monosaccharides are often referred to as simple sugars. And this is because they consist of a simple molecular structure. To put it another way, “mono” means one and “saccharide” means sugar. So one sugar as a direct translation. Glucose – All forms of sugar that your body ends up using for energy are eventually turned into glucose. This is an important point we’ll come on to later. Fructose – This is basically what you’ll get from fruit. Fructose gets processed by the liver into glucose and then released into the blood stream for use. Galactose – Sometimes referred to as “milk sugar”, which is why it’s commonly found in dairy products. Again, it gets metabolised into glucose in pretty much the same way as fructose. Are you seeing a pattern forming yet? Let’s continue with our brief foray into etymology. We can determine that if “mono” means one, then “di” means two. And therefore disaccharide can be translated as “two sugars”. These forms of sugar consist of two monosaccharides joined together. A couple of common disaccharides you’ll come across daily would be sucrose (table sugar) and lactose. Sucrose is the 50/50 combination of glucose and fructose. This is found naturally in many plant foods. Lactose may be quite familiar to a number of you. No doubt you’ve heard of lactose intolerance. It’s something that’s grown in prominence over the years. Lactose is the combination of glucose and galactose. And the intolerance to it is related to the inability to break lactose down into glucose and galactose. We’re learning a lot of fancy names already with this article and here’s another. An oligosaccharide contains between 3 – 9 monosaccharides. Cereals, artichokes, onions, and canned foods are all examples of oligosaccharides that you’ll come across on a daily basis. The majority of oligosaccharides are not digestible by the human gut. However, that’s not to say they’re useless. In fact, it’s quite the opposite really. As oligosaccharides aren’t digestible they provide health benefits in that they feed our friendly bacteria in the large intestine. Raffinose is a common example and is found in beans and other legumes. As your gut tries to process these sugars, gas bubbles are formed, which gives rise to that famous phrase. Finally, we’ve got polysaccharides. And these are your complex sugars, which contain 10 or more monosaccharides arranged in chains. There’s many different types of foods that contain polysaccharides, but I won’t bore you with a massive list at this stage. The main ones you’ll come across are either starches (potatoes, pasta, bread), and cellulose (leafy vegetables, peas, lentils). And these polysaccharides are either defined as digestible or non-digestible (ie fibre). The digestible kind get processed by the body and end up as glucose that the body then uses as its energy source. This leaves the undigested sugars, or fibre, to assist with proper function of the gut and bowel movements. Basically, these are what keep you regular. Did you spot the common theme? So, after our whistle stop tour of sugar science you probably noticed a common thread. Either sugar come in a form that can be processed into glucose for energy. Or it comes in a form that cannot be digested, ie dietary fibre. But let’s also be clear that if you overeat sugar (of any type) the liver will process these and turn it into fat. And if there’s one thing you take away from this article, make sure it’s this. You’re body can’t tell the difference between the sugars from a donut and the sugars from a banana! Your body is an effective machine and just gets on with the job of breaking the sugars down into usable energy. What can’t get digested and used, ie dietary fibre serves an important process in the gut and keeps things running smoothly (literally) in your intestines. The difference between the types of sugar you consume comes with the rate with which it gets processed. And this is the point that many people zero in on when demonising sugars. Let’s look at the humble donut. Full of sweet sugar, which makes it taste pretty frikkin’ good, let’s not kid ourselves. The sugars it contains are pretty much exclusively simple sugars (monosaccharides). As a result, the body doesn’t have to work hard to turn this into useable energy. Conversely, green vegetables contain a mix of poly and oligosaccharides and take longer to be metabolised into energy. But does this even matter? Well, the answer is a little bit of yes and no. To put it another way, it’s not important whether the sugars are processed quickly or slowly. Because at the end of the day, the result is the same. It turns to glucose for energy or fibre. But on the other hand, it does make a difference for those of you looking to lose weight, although not in the way you might think. It matters because you’re more likely to feel hungry sooner after consuming something with simple carbs, than you would if they were complex. That being said, if you don’t have a problem with keeping hunger at bay, then this really isn’t something you need to worry about at all. Is a low-sugar diet the answer to all your problems? Sometimes I feel like a cracked record on this one, but I’ve not seen a robust scientific study that dispels the theory. Energy balance is what matters most. Calories in vs calories out trumps everything else. To put this another way, it doesn’t matter what form of sugar you consume throughout the day. If your goal is to lose weight, then as long as you keep within you calorie targets, you’ll achieve your goal. On the other hand, if you pound the sugars (of any type) and go way over you calorie target, then that excess is likely to be stored as fat. So, you could eat all the complex carbs you want, but if you eat too much, you’ll get fat. And that could be in comparison to someone that eats a bunch of simple sugars, but has the amount under control. That person WILL succeed in their weight loss goals. Although, energy balance is king in this scenario and that’s your number one priority, you should start to think broader than that. Sweets and donuts contain a lot of dead calories, ie they have added sugar that has no nutritional value. A banana has a shed-load of micronutrients and added health benefits, even though it’s a simple sugar. The added sugar in your cans of Coke and Pepsi are bringing you little (if any) nutritional value. Therefore, the consensus is to limit the intake of these added sugars. Further to that, added sugar can effect your health in other ways when consumed in excess, ie tooth decay. In addition to that, consumption of these foods can make it difficult to lose weight if not controlled. The added sugar makes them more calorie dense and increases the likelihood of exceeding you calorie targets for the day. So, if energy balance is what matters and your body process all types of sugar in the same way, then we can determine one thing. Sugar is not the problem. The problem is your ability (or lack of) to control the amount you consume versus the amount you need to achieve your goals. Because, as I mentioned earlier, if you eat too much sugar, your body will store the excess as fat. But that’s looking at things from a pure weight and fat loss perspective. You’ll need to bring a more balanced approach to ensure you’re optimising health as well as aesthetics. Therefore, you don’t need a low-sugar diet to achieve results. You don’t have to put yourself through the misery of limiting the foods you love. How much sugar should you eat to lose weight / fat? 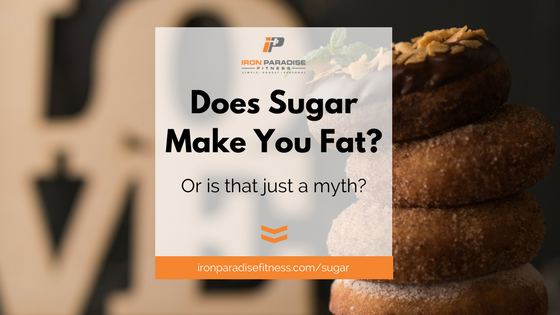 Now that we know what sugar is, how the body uses it, and importantly that you don’t have to live without it, there’s just one question left unanswered. How much of the stuff should you actually eat every day? Well, the real answer is that you can have as much or as little as you like as long as you’re within your calorie targets. For example, you could follow a diet like John Cisna, who became a small time celebrity in 2014 after following a McDonald’s only diet for 6 months. In the experiment, he ate nothing but food from the famed golden arches and proceeded to lose 56 pounds and reduce his “bad” cholesterol by 25%. Whilst not a diet that I (or even he) would recommend, it does prove the point about energy balance. However, we’re looking at optimising your diet for an aesthetic physique and to look toned and muscular. So in reality the McDonald’s diet isn’t going to be the best approach. It’s likely to leave you deficient in a lot of essential vitamins and minerals for a start. Not to mention the fact that small quantities of the foods you’d eat would have a disproportionately high calorie count. So, the answer lies in this simple 4 step process. Consume a high protein diet with calculated macronutrient requirements based on your current weight, body fat %, and activity level. This will ensure you meet your energy balance targets and optimise your diet for retaining and building lean muscle. Balance your carbs to meet your own personal preference. Some people like more carbs than fat and vice versa. The important thing to remember is that your calorie and protein numbers are the most important. And your carbs and fat are flexible to suit whatever you prefer. Apply the 80/20 rule. When setting up your nutrition plan and selecting foods, make sure 80% of them come from whole foods. This means pack in the fresh meat, fruits, and vegetables for the lion’s share of your diet. The donuts, sweets and treats should only make up around 20% (or less). Be patient and stick with it. There are no quick fixes, so don’t look for one. That crash diet, which eliminates sugar altogether is not sustainable and you’re likely to pile the weight back on when it’s all said and done. Be consistent and be patient! Now, if that all seems a bit overwhelming and confusing, don’t panic. I want to help you get the perfect nutrition plan that gets you to your goals and is full of foods you love. And if that sounds good then I’ve got a free nutrition eBook you can download. The guide will walk you through the exact approach I use with all my clients to achieve great results. And it’s also the approach I use to build my own physique. You’ll have everything you need to achieve some fantastic results. And all without selling your soul to plain chicken and rice for every meal. So if that sounds good, just go here and grab your copy for free. In summary, sugar is not the enemy of fat loss and that is a myth that certainly needs to die. Because at the end of the day, the body processes sugars in the exact same way. The only difference is the time it takes to do that. Energy balance is still the aspect of your nutrition that matters most. Getting your calories and macros dialled in should be your number one priority. And remember to calibrate those macros in favour of a high protein diet. Once that’s in place you can flex your carb and fat amounts to suit what you prefer. But don’t be tempted to overload on foods with high amounbts of added sugar. Donuts, ice cream, and McDonald’s might taste good, but they lack the additional micronutrients that are so important to overall health. And those foods are also not going to make you feel as full as their whole food counterparts. So it’s back to the 80/20 rule. 80% whole foods and 20% treat foods. Not only will this be beneficial for micronutrients and feeling full, but it will also mean you’ll be getting the fibre your body needs to maintain a healthy gut. Overall it’s about moderation and finding what works for you.